Tim Stamps is a master craftsman whipping up sleds for world class surfers and average joe’s alike. We picked his brain a little to find out how he got his start and get an inside perspective into Stamps Surfboards. How and when did you get your start at shaping? Well, I spent a lot of time in the back of Harbour Surfboards in Seal Beach, CA since about the age of 14 or even younger. Everything was being done on the premises from shaping to the finished product. I was there to see it all, cleaning up, watching for hours every day, and lending a hand when I could. Eventually I learned everything, in the back of the shop there, about board building from the bottom up. I went from shop ‘grom’ clean up kid to eventually ‘shaper’. I get my inspiration from all sorts of places. I see curves in nature that get me thinking, I see surfboards from all eras, and I see waves and how people want to ride them and think how I can blend all these things into my designs. I usually take these ideas and make a board for myself to test out and see how it feels or I blend something into a ‘team’ rider and get his/her feedback on a subtle change or a whole ‘new’ idea put into the board. Bottom line, surfing inspires me in my shapes and my life! A sneek peek into the Stamps Cave. Photo: @asildaphotography. You have a wide range of boards you shape, logs, fishes, HPSB, etc. do you have a favorite kind to shape? Ya, designing and shaping a wide variety of boards is something I pride myself on, not being a one dimensional shaper, but having many facets to what I do. For me it keeps it interesting and fresh. I’ll do a bunch of pro boards, then I’ll reset my mind and do some logs, fish, hybrids of all sorts. It just keeps it fun and fresh and the more curves you look at and use the more you see how and where they all start to fin into one another and relate all on the bigger picture of design and how you want a board to work. I like to ride all sorts of boards as well, I ride everything I make so that also keeps me interested and motivated. I get bored pretty easily so my mind is always occupied by refining design and pushing forward with all types of boards. What is your go to board to surf? Well, that’s a tough one….. I guess it depends on the season and what my mood is. I’d say generally I have in the mix a log, fish, super-grovellor, grovellor, and a ‘shortboard’. Most often lately i’ve been riding my latest version of my Twin Keel Fish, the GrinderX, and a few twist and turns on a couple new models I’m working out. Also, I can’t leave out the Axis for some fun summertime loggin’! The Grinder X model, the Stamps version of a twin keel fish. The Axis by Stamps Surfboards. A great log for summer fun. What is your best selling model and why? If i had to pick out the best selling models, it would be the FX, the Flare, the GrinderX, and the Scarecrow. I know that’s not ONE model, but they are all about equal because they all hit that spot in the quiver that people are looking to fill, or they can all be that ‘one board’ that is a comfortable ‘go to’. A highly tuned machine for Brett Simpson, Courtney Conlogue, or You! Photo: @asildaphotography. You have a number of world class surfers riding your boards on the world tour, how is it working with them and what is the pressure like to get their quivers dialed in? I have two main WT surfers, Brett and Courtney. I also do quite a few boards for a lot of others chasing the tour and a few more for those who are passing through or just want something different to fill in the quiver. Working with this caliber of surfer is very rewarding and difficult at the same time. The best is expected, and we are always chasing the ‘perfect’ board. It’s really demanding and causes lots of sleepless nights! haha…. It’s tough and you have to be able to hear the good and bad and sift through it, surfers at this level aren’t ever satisfied and the feedback I get from the group that I work with is priceless. What new technologies/designs do you think are making an impact right now? With materials you know, I see lots of ‘new’ stuff out there and I try pretty much all of it. 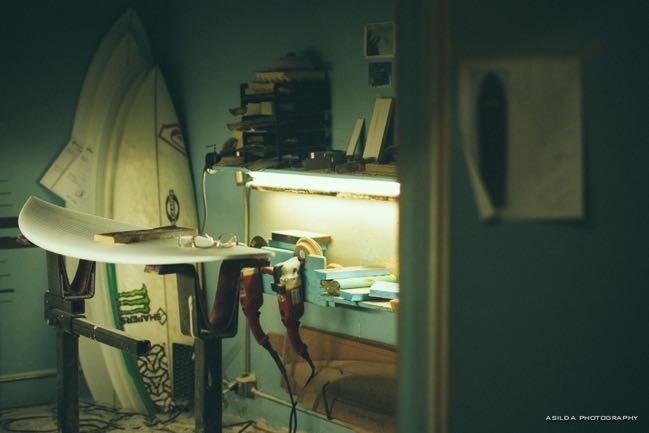 Will anything step up and change what the standard surfboard is and how it’s made? I don’t know. 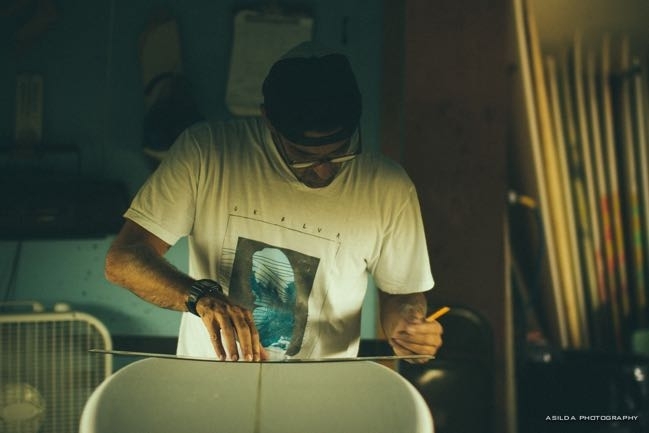 Sure there’s a way to make lighter boards, more durable boards, environmentally friendly, and all combos of that….but what we are really chasing is a board that performs better? I don’t think anything is really there yet as to making a ‘better’ performing board. Design wise, I think the next subtle leap will be a refinement of what we have now, when wave pools become available and when that’s where a lot of surfing is being done. Paddling will be taken out of the equation and how the waves break will determine what design features we need and what we don’t. Rather than scoffing at the idea, I see at as a challenge and I know a few others who see it that way too. Poly or Epoxy, what is your preference and why? I’ve ridden lots of both and I always seem to be playing with something Epoxy, but everytime I jump on a ‘team light’ glassed PU/PE (polyurethane foam/polyester resin) they just feel ‘right’ and natural to me. 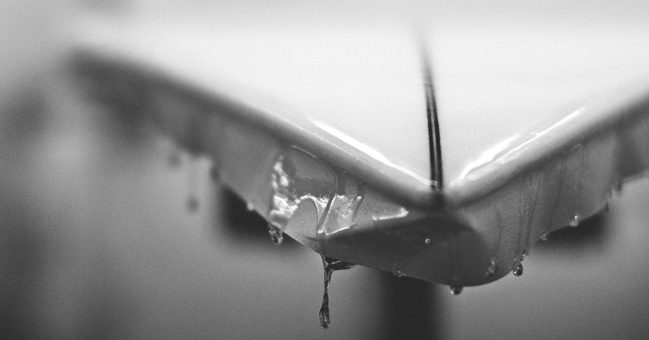 A freshly hot-coated stick by Stamps Surfboards. Photo: @asildaphotography. 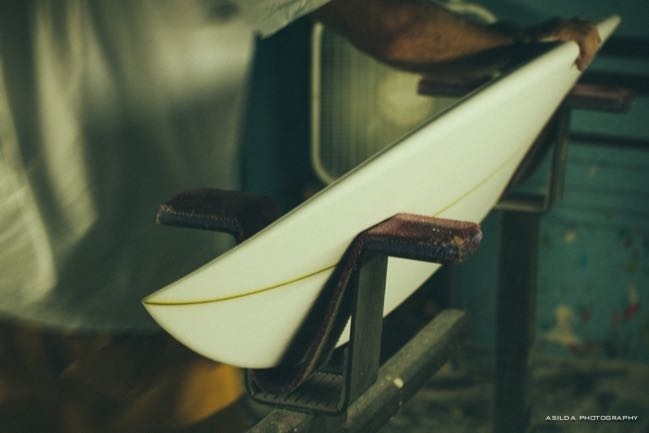 What is the future of surfboard design? Wavepools! Shorter, rounder, narrower, boards we don’t need to paddle! Hahaha…..
What is in the future for Stamps Surfboards? The future of Stamps Surfboards is to keep on the path that I’m on and what has got me to where I am now. For more information and the full range of surfboards ready to be customized and order online, check out Stamps Surfboards. Use the Board Engine to help find your volume.